The fishing gear is packed again. Next week I’m headed to the Chicago area for Trout Unlimited’s Upper Midwest Regional Rendezvous. One of the many benefits of these meetings is the pre-event fishing day. I always enjoy a chance to spend a day with new friends on new water. The anticipation of exploring the unknown, and maybe making an incredible discovery, is part of the appeal of fishing for many of us. But as much as there is excitement in exploration, there can be comfort in familiarity. Not because fishing areas we know is necessarily more productive and easier than trying to figure things out somewhere new. Going back to our spots time and again can give us a chance to get better. To grow and learn. As fun as it can be to make the first cast in a new place, it can be exciting to return to a familiar spot. Maybe that spot produced a great fish. Or maybe it presents a particularly tough challenge that, when we finally figure it out, is going to be especially rewarding. On a recent mild Virginia winter day I was able to slip out to one of my favorite local trout streams. It’s a small creek but has a few deep, juicy holes. One is spectacular, in part because it’s so tough to fish. The water slides into it through a steep chute that creates a variety of competing, swirling currents. A huge submerged boulder in the middle of the pool further complicates drifts. But the biggest challenge is a large deadfall, its tangle of branches crowding at least half of the hole. 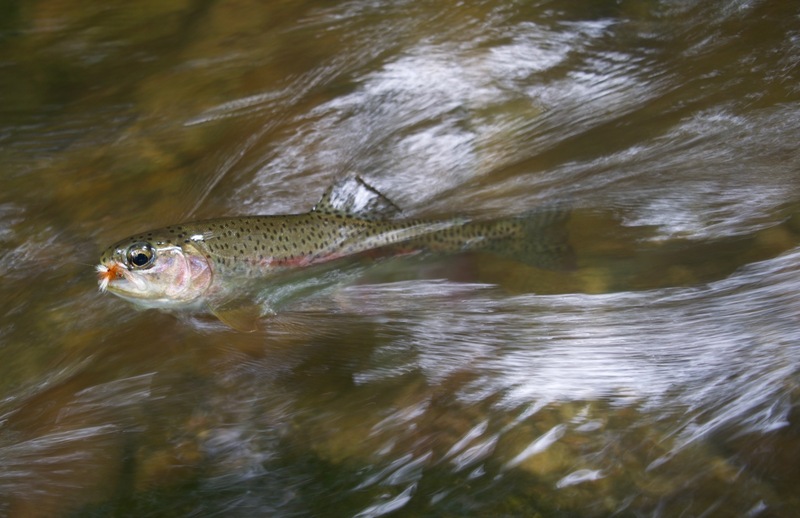 Even if you can manage a good enough drift to fool one of the chunky resident wild rainbows, pulling the fish out of the mess is next to impossible. How can you not love a spot like that? On that recent day I was able to finally get a decent drift through the hole with a small nymph and felt the solid “tick” of a take. Was it one of the 15-inchers that would immediately wrap my tippet around a branch? Nope. Just a spunky 8-incher. The challenge remains. Maybe what’s most appealing about familiar spots is that they can slow things down, and that’s becoming more important as the years fly by. This past summer when I was in Oregon visiting my parents I headed out one evening to the local river, where I grew up fishing for smallmouth bass. I went to a spot where I fished a lot as a teenager. I parked in the same roadside pull-off, and scrambled down the same dusty trail to the river. The only thing different as I hopped across rocks on the shore were the aches and pains in my well-worn knees and back. Well, that and the fact that I was toting a fly rod instead of a battered Eagle Claw spinning rig. As I surveyed the hole I recognized the shapes and locations of the submerged rocks and ledges. Would there be a bass behind the orange boulder? I stared hard through the swirling current. And there was a fish, right where it was supposed to be. Mark Taylor is Trout Unlimited's eastern communications director. He lives in Roanoke, Va., and has spent the past 20 years enjoying a list of familiar waters in the region that is growing slowly but steadily.